Show stopping crystal statement necklace with the glamour of 1940s Hollywood - perfect for all that glitz occasions. You could just imagine this glamorously elegant ‘piece’ adorning the décolleté of a beautiful Hollywood actress in an old black and white movie. Taking inspiration from the late 1940s, Cascades of Crystal Necklace makes a show-stopping statement full of refined sophistication. 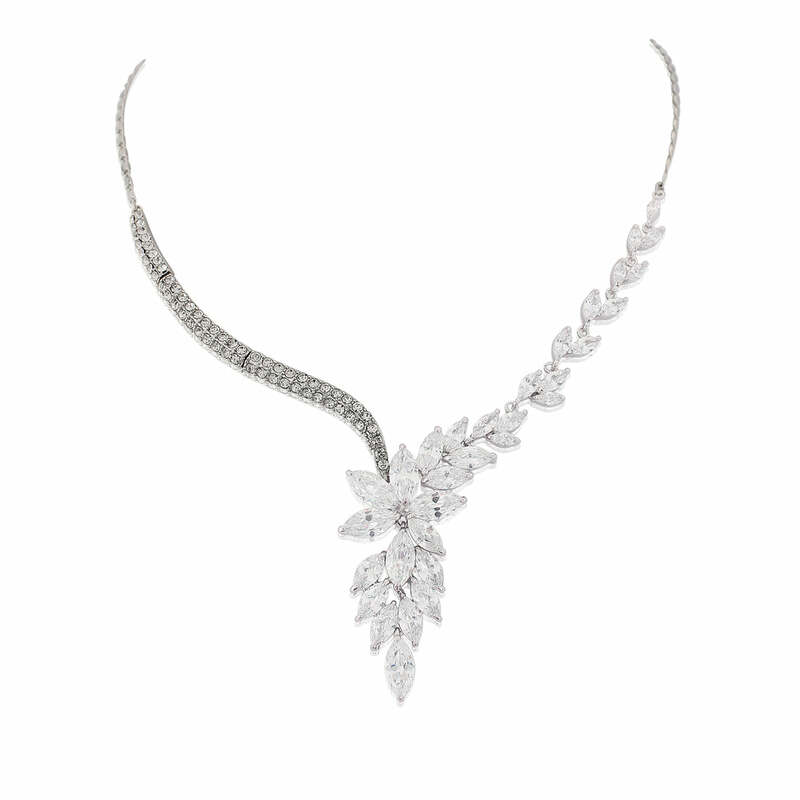 With a slim Austrian crystal studded curve and an abundance of cascading cubic zirconia leaves, this breath-taking asymmetric design reflects the graceful style of one of the most timelessly glamorous eras in fashion history. The perfect crystal necklace to wear for special evening occasions, it looks particularly amazing with a strapless neckline. Pile up your hair in a tousled top knot and allow this pretty piece to shine. 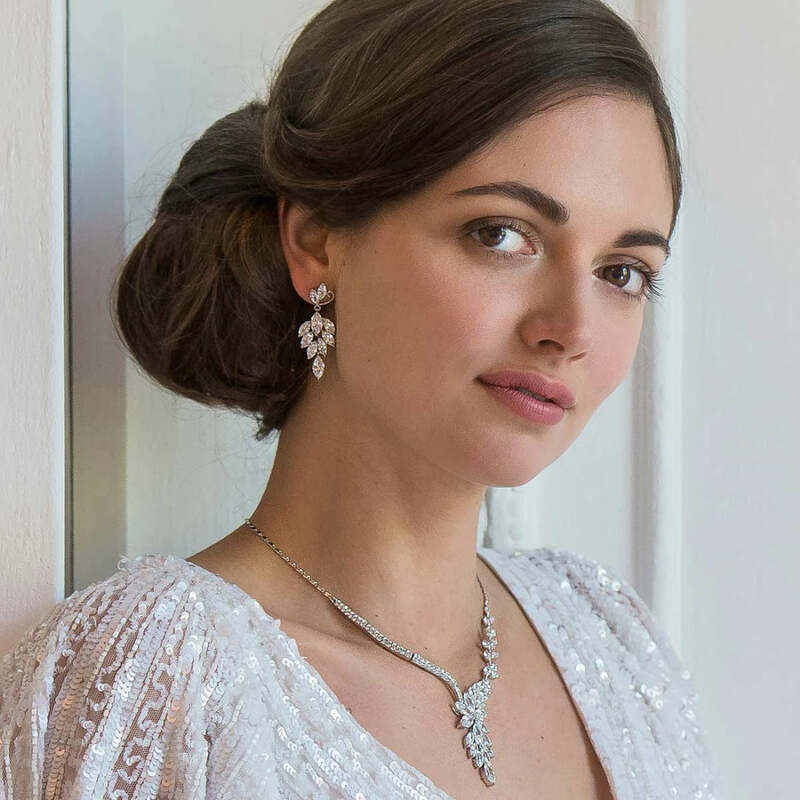 For the bride who wants to channel Old Hollywood style on her special day, Cascades of Crystal is the perfect wedding necklace. Become the ultimate vintage bride and achieve silver screen charm by coordinating this divine accessory with our coordinating earrings and a bejewelled hair clip set in a low side chignon.